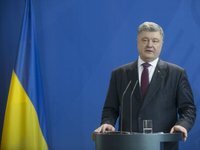 The leaders of Germany, France and Ukraine have agreed to provide security conditions for launching the political process and holding local elections in the territories not controlled by the government in Donbas by the spring of next year, Ukraine's President Petro Poroshenko has said. "For a certain period of time, we've agreed that this should be no later than March 2020, by the time the local elections are held all necessary security conditions will be created," Poroshenko said on the air of Inter TV Channel in a video call from Paris after a meeting with French President Emmanuel Macron. "As soon as the security component of the Minsk Agreements is established, [it is necessary] to immediately proceed to negotiations on a political settlement and try to hold local elections no later than March 2020 and thus complete the political process," the head of state said. He noted that the peace process provides, above all, a security component: the withdrawal of foreign troops, heavy weapons and artillery. "The security component is the desire of Ukraine, which, I firmly believe, our partners will take notice of - this is control, in particular, through peacekeeping operations in the uncontrolled segment of the Ukrainian-Russian border," Poroshenko said.